I met author Emily Jiang very briefly at the Nebula Awards and again at the Locus Holiday Party. That sentence made it sound as though my life is far more glittering than it actually is. Anyway, emily and I had a great time at the party talking about how parties are terrifying and singing scraps of Sondheim to a long suffering Setsu Uzme and long story short Emily agreed to do an interview for us here at Geek Girl. Little did I know that it would include haiku! I’ll be doing several posts this month on the importance of diversity in children’s literature and YA this month. Emily’s picture book is gorgeous to read and to look at, thanks to illustrations by April Chu (all images below are by April). It’s a series of poems and prose about Chinese musical instruments. What did you do to prepare for this book? Before I decided to write the book, I was only familiar with the erhu and the guzheng, so I had to research quite a bit. I found books written in English about Chinese Music and read them cover to cover and I scoured the internet for sound clips and Youtube videos to hear what they sounded like. It was great fun. I love learning about little-known cultures and finding little-known facts. Sometimes those facts are not relevant, but often I’ll stumble upon a fact that shines like a gem. What was your process like when working with an illustrator? Unlike comic book writers, picture book authors working with traditional publishers are not supposed to suggest artwork to their books’ illustrators. All I asked was that the children be ethnically diverse and not all Asian. Why was this book important to you? I think of myself primarily as a fiction writer, more specifically as a novelist, so it’s a bit of a surprise to me that my first book was a picture book. But I now I absolutely love it! I am passionate about music and I am passionate about understanding non-American cultures, especially that of my ancestors. One thing that I’ve noticed is that the illustrations show children from a variety of ethnic backgrounds playing the instruments. Why did you choose to have so much diversity in our book, and why should we care about diverse representation in children’s literature? In this article Lee & Low also used statistics from the Cooperative Children’s Book Center and made this chart that shows that while the population of people of color in the United States has risen to 37% as of 2012, the number of new traditionally published children’s books by and/or about people of color has stagnated at roughly 10% over the past eighteen years. The US census projects that by 2060, the percentage of “minority” populations will be 57% of the United States. “The US is projected to become a majority-“minority” nation in 2043.” Clearly the children’s book publishing industry in the US is not keeping up with the changing population of their young American readership. We need more books where an American non-white child is the protagonist, not the sidekick. We need more books where children from underrepresented populations can see themselves as the center of the story. Shouldn’t the American children depicted in American books reflect the growing racial diversity of the United States? This is the epiphany I had almost two years ago, right after I had completed the revision of my manuscript that my editor was going to send to my illustrator. So I asked my editor if it would be okay to ask the illustrator to make the kids ethnically diverse with an emphasis on Asian children. Luckily, I had made a conscious choice before writing the poems to focus on the child’s relationship to music rather than to ethnic identity. This gave the illustrator even more freedom to choose each child’s appearance according to race, age, and gender. Everyone can enjoy my book about Chinese music, regardless of cultural background and/or ethnicity, because Chinese music can be enjoyed by everyone. 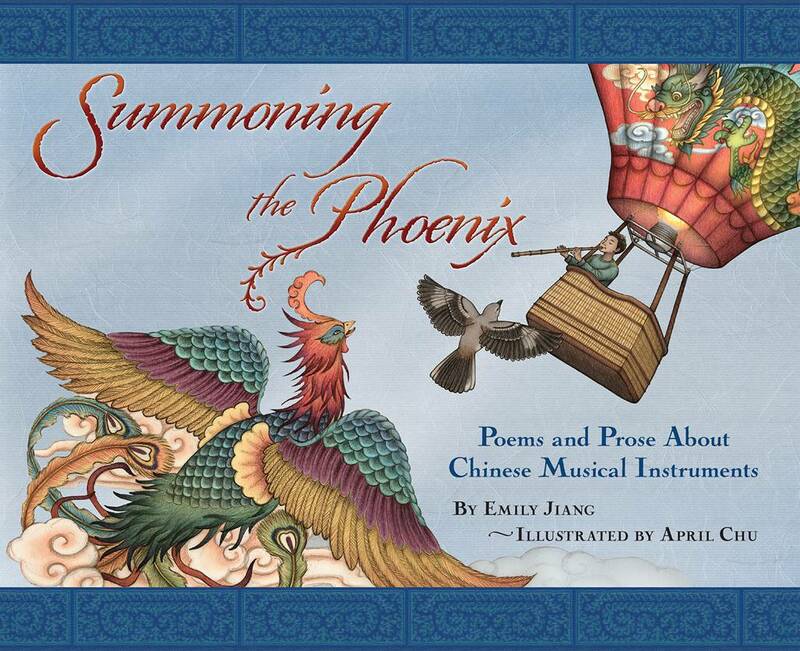 This entry was posted in Interviews and Special Guests and tagged April Chu, Chinese musical instruments, Emily Jiang, Summoning the Phoenix.